Does language destroy the evolutionary model and prove the Flood? Dr. Reagan: We discussed earlier the Gap Theory and how people have tried to use that to adjust the Bible to Science. There is also another way they try to do that, and it's called Theistic Evolution. Many who believe in Theistic Evolution also believe in the Gap Theory. What exactly is Theistic Evolution and what are the problems with this theory? 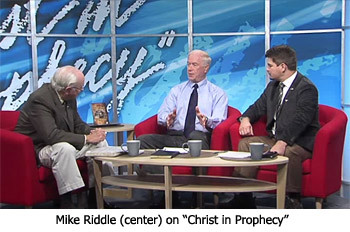 Mike Riddle: Theistic Evolution is the idea that God used some form or forms of Evolution during His creative process. I hear this statement a lot of times, that God could have used Evolution. It's the wrong statement to make for a Christian. It's not a matter of what God could have done, rather it is a matter of what He did do as recorded in the Bible. There are some problems common to all the Theistic Evolutionary models concerning the days of creation being long periods of time, which the Bible does not teach, nor does Science support. For example, one such falsehood is called the Framework Hypothesis, where Genesis is taken as just being poetic and is not meant to be taken as real history. There are other forms out there, but they all have one basic thing in common, and that is the idea of billions of years. If we add billions of years into the Bible, that is clearly teaching death before sin. What happens in those billions of years is death, decay and disease, and that would all have to have happened before sin. If death was already there before sin, then why did Jesus Christ have to go to the cross and shed His blood and die and conquer physical death? We lose our foundation of the Gospel. Here's another argument from Genesis 1:31. God looks back on His entire creation and calls it, "very good." If we've already had billions of years of death, decay and disease like cancer which we find in the bones, then God is calling cancer very good? That oddly enough is what Theistic Evolutionists adopt. Nathan Jones: The Bible obviously goes back some four to six thousand years. Then we go back to most human records, and all human records only go back a few thousand years. If we have millions of years of human history, why then don't we see a book from 100,000 years ago, or a cave painting, or something that is really old? Mike Riddle: Well, you answered the question, for if we really had millions of years, we would have records today. But, since humanity really hasn't had millions of years, we don't see any records older than the Bible. We can even look at just language itself, and what we call the oldest or earliest of languages, well they are very complicated. Language didn't start off as simple languages. These early people did not communicate in grunts. We only think that from watching television. When we look back at the ancient peoples, they were not dumb back then. They were very smart people. Just look at Adam and Eve the things they did. One of my studies I teach is on ancient Egyptian mathematics. The people that were building the pyramids were using Calculus. They were very smart people back then. Sure, they didn't have the modern technology that we have with our computers, but what they achieved shows that people have always been very smart and very intelligent. When life spans were much longer and people lived a long time, they accumulated a vast amount of knowledge. So, yes, the records only go back to about the time right after the Flood. What was the purpose of the Flood? It destroy all of mankind. God did that. So, our written records will only back to about the time of the Flood, which is about 4,500 to 4,600 years ago. In the tenth segment of this Creation training series with Mike Riddle, he'll explain why Carbon 14 dating destroys the Evolutionary model.